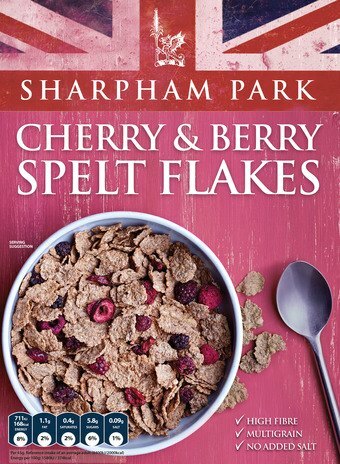 Crispy light spelt flakes with delicious cherries, blackberries and raspberries and no refined sugar. NEW: Now available in packs of 6 - choose this option and you will buy 5 and get 1 free. Rice 52%, Spelt Bran 18%, Flaked Barley 10%, Raw Cane Sugar 5.6%, Pinhead Oats 3.3%, Barley Malt Extract 2.2%, Cane Molasses 1.9%, Freeze Dried Fruit: 7% total: Blackberry 3.5%, Cherry 2.5%, Raspberry 1%. For allergens see ingredients in bold. Unsuitable for coeliacs.